Concerns about a referendum on British membership in the European Union, and political split with Scotland, cloud long-term outlook. 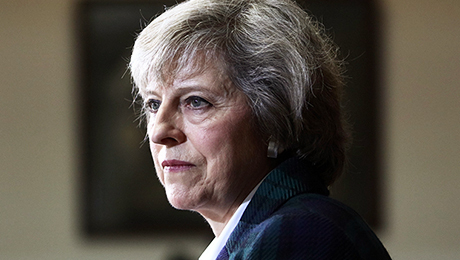 The euphoria in U.K. financial markets over the surprisingly large Conservative victory in last Thursdays general election has quickly turned to caution over the potential political instability that may yet lie ahead. Stocks were little changed on Monday after rising by more than 2 percent on Friday, with the FTSE 100 blue-chip index trading around 7,049. The pound, which jumped almost two cents against the dollar on Friday, firmed to $1.5517 from $1.544 at the end of last week. Defying many predictions of a hung Parliament with no single party in control, Prime Minister David Cameron led his Conservatives to an outright majority with 331 seats in the 650-seat House of Commons. The party will now rule with a firm hand as its former coalition partners, the Liberal Democrats, imploded, while the opposition Labour Party captured only 232 seats, underperforming expectations. Yet investors who look to the long term warn that one source of political instability lies ahead: a referendum on the U.K.s membership in the European Union. 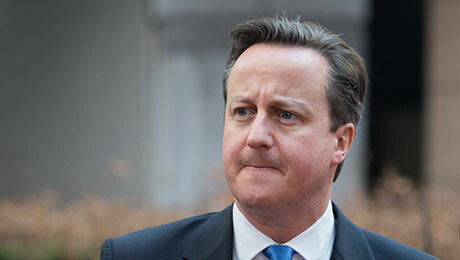 Cameron reiterated in his victory speech on Friday his promise to hold such a referendum. A vote for the so-called Brexit would foster the biggest change in the U.Ks relationship with the outside world in more than a generation and raise questions about British companies access to the EU single market. Cameron will also have to contend with a yawning internal political gap, between Scotland and the rest of the U.K. The Scottish National Party (SNP), which ultimately wants independence for the region, swept 56 of Scotlands 59 seats in Parliament, an unprecedented result. The Conservatives, Labour and the Liberal Democrats were each reduced to just one seat in Scotland. Cameron had repeatedly pledged that if reelected he would call a referendum by the end of 2017 on whether Britons want to leave the EU, after first negotiating with member states for the return of various powers to the U.K., including the right to limit immigration from other EU countries. 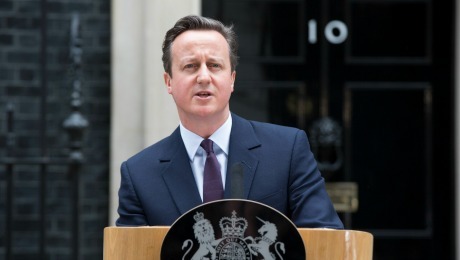 Cameron has hinted that he might consider recommending a vote for Brexit in that referendum. But he hasnt said so explicitly or made clear exactly what he requires as acceptable concessions. Investors warn that regardless of the result, the mere fact that a vote will take place could hit economic growth, and hence corporate earnings, as multinationals worry about whether they would be able to access the massive EU market from the U.K. without troublesome trade barriers. David Page, London-based senior economist at Frances 623 billion ($695 billion) AXA Investment Managers, thinks concern about the EU referendum could shave 1 percent off business investment, a key element in Britains economic recovery. Such a hit to growth could reduce corporate earnings and dampen equity markets, but the effect would be small compared with the likely market reaction to a vote for Brexit, says Page, who estimates that such a verdict could push stocks down by 10 percent and send sterling below $1.40. Recent opinion polls show a small lead for staying in the EU, but skeptics say past polls show the volatility of opinion. The risk of Brexit may be closer than many investors think, as some political observers caution that Cameron might feel pressured into calling a referendum before 2017. This demand was one of the central tenets of the UK Independence Party, whose recent rise in popularity pushed the Conservatives into their referendum promise. Although UKIP won only one seat in Parliament, the party captured 12.6 percent of the popular vote, trailing only the Conservatives and Labour. Although Cameron has, in theory, no need to humor the fiercely Europhile SNP, he has signaled since his election victory that he wants to close the political rift that has opened between Scotland and the rest of the U.K. since last years Scottish referendum campaign, when the SNP unsuccessfully fought for independence. Some investors warn, however, that the greatest pressure of all on Cameron to take a tough line on Europe may emanate from within his own party. Euroskeptics gave John Major, Conservative premier from 1990 to 1997, a rough ride by exploiting his wafer-thin majority (which eventually disappeared altogether) to demand concessions. Major famously called them bastards in an unguarded moment. Cameron may, in due course, rack his brain for a similarly colorful word.